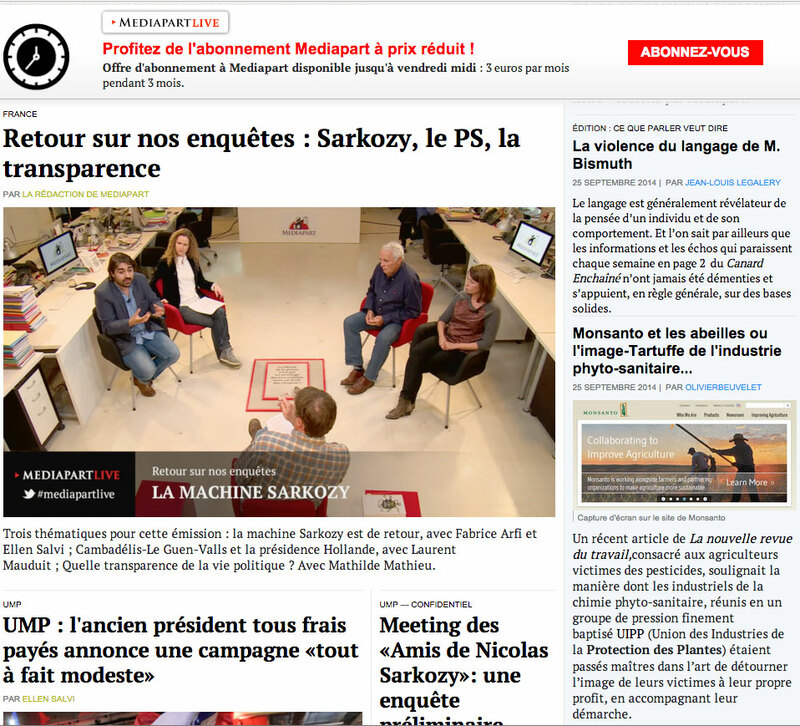 What is “native advertising” anyway? The IAB has published their view. I have my own opinion. One of the biggest problems with “native advertising” is that it is such a new, made-up term of digital art, that it’s taken on an Alice in Wonderland-esque quality, in which the phrase means whatever the speaker thinks it means in that moment, while the listener pretty much has their own interpretation. Posted: under newspaper crisis, Newspapers. Web-native companies strive to eliminate “transactional friction.” Newspapers? Not so much. I’ve been a subscriber to the LA Times for as long as I’ve lived in Los Angeles, and I’ve watched as the big beast evolved from a gray morass of 100-inch stories to the biggest (and most profitable) paper in the U.S. in the late 90s. Which has made the last decade and a half so very hard to watch. Still, I’ve stuck by Gray Lady West through some very tough times, and I have many friends who either work there now, or have in the recent past. As newspapers increasingly set their sights on a “digital first” strategy (despite some notorious recent flameouts), it occurs to me that they are neglecting one of the most crucial, and overlooked departments in the entire organization: circulation. I got unpleasant evidence of this when I attempted to renew my subscription to the Times. First: a lesson in what “failure of the last mile” means: consider what goes into making a successful restaurant. You have to have a prime location. Decorate the exterior. Decorate the interior. Hire a great chef. Hire great kitchen assistant chefs. Come up with an innovative menu, with food that appeals to your core demographic. Procure the freshest ingredients. Ensure that the food prep space is clean and gets an “A” from the city inspectors. Advertise. Market. Give out coupons. Sweet-talk reviewers into coming and writing reviews. Have valet parking. And so much, much more that all leads up to the “last mile” – what the experience is like at the “touch point” where the customer actually engages with the product. In a nutshell: all this effort in preparation to make a great restaurant counts for nothing if the waiter is snotty to the diners. I’ve seen this in action again and again with the startups I’ve been involved with. Early on, we faced epic levels of “cart abandonment” when trying to coerce people into making a purchase, because (at the time) people were really, really reticent to type their credit card numbers, expiration dates and security codes into a browser window. Since then, we’ve obviously learned that data theft can pretty much happen anywhere. However, this hurdle was gradually overcome via the efforts of eBay, Amazon, iTunes and PayPal. All of which add layers of security, and money-back guarantees if your card gets hijacked and used to buy pallets of AK-47s in Cote d’Ivoire. So here’s what trying to buy a subscription from the LA Times looks like. You dial a number. There’s a choppy, slow voicemail hell, with choices that really don’t seem to apply to what you want to do. There is no dedicated 800 number for renewing subscriptions – you just get dumped into the bin with people who want to report their paper getting stolen, or who want to turn it off while they go visit the grandkids. So that’s turnoff #1. Even as a dedicated subscriber, I wanted to hang up and just try the website to see if I could get a better experience. Still, I hung in there to see whether things would improve. It took 3 steps and 2 minutes to get to a place where I could finally start to accomplish what I came for. Unfortunately, rather than talking with a human – I had to manually enter a credit card number over touch-tone. That’s Strike Two, folks. If you’re going to be giving up that kind of info, consumers kinda want to get rewarded with a human voice, particularly if they have any queries about what they’re buying and how much it costs. Which I did. So I grimly stuck to it, even after entering my financial information, hoping to get someone on the phone to explain the rather complex choices on payment amounts and term of subscription that came on the paper bill I was mailed. Pressing the “0” button just kicked me back into the main menu. Somewhere along the line, as the frustration increased, I heard that I had to “Press 9 to Speak to a Representative.” Only, that kicked me back to the main menu as well. Finally, I started doing “button mashing” which usually triggers a kickout script in the automated phone-tree software. Call centers have learned that when they have tortured consumers to the point where we start just randomly pushing buttons and screaming with frustrated rage, maybe it’s time for some human intervention. Sure enough, there was a silent blip as the call was transferred to a call center. Not in India – the costs for call centers have gone up there. No, this one was to the new lowest-cost call center hub – in the Phillippines. The operator was friendly enough, but the problem started when I asked about the payment terms. Under the subscription plan they now offer, the LA Times gives me unlimited web access (which is mostly how I engage with their news product these days no surprise), and charges me about $12 every two months. But looking at the rate card I was mailed, it seemed as though they were trying to incentivize me to subscribe for 6 months or an entire year by offering price breaks for these longer-term commitments. So sure. Maybe if you let me shave a few bucks off the bill, I’ll pay you the whole amount upfront and let you make some money off the “float” of having my entire wad of subscription money that you can earn interest on. 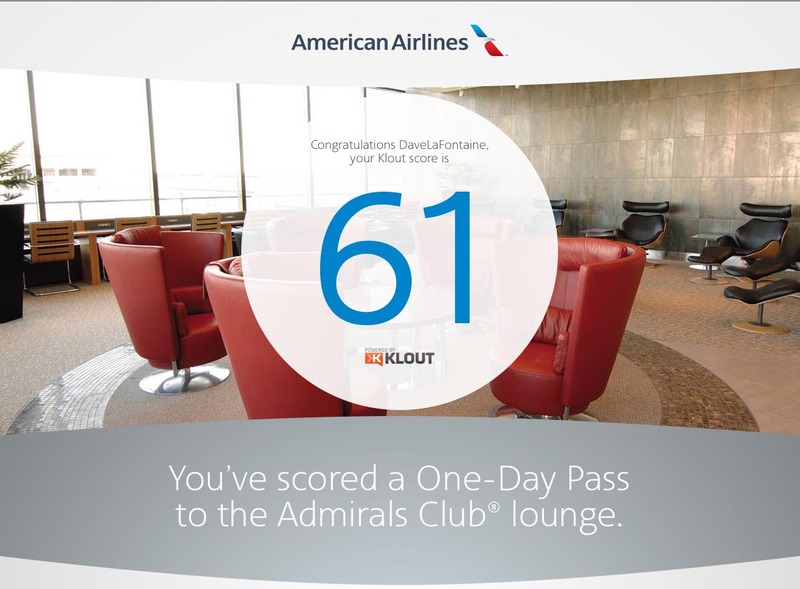 It’s one of the ways that smart companies entice consumers into locking themselves into making a yearlong commitment. Unfortunately, the call center operator had no earthly idea of the pricing structure for the product she was trying to sell. After having to verify (for the 3rd time on this now 15-minute call) my phone number, address, name, credit card number, etc., just asking how much I was going to pay flummoxed this person. I was quoted three different prices for the subscription I now have. I corrected the operator a couple of times, and finally after teaching her about the product she was trying to sell, got to the bottom line. I can pay $12 every two months for the next year. Or I can pay $83 up front to “lock in” the subscription price. If I pay every two months, that’s six payments a year, right? Simple math: 6 payments x $12 = $72 a year. And you want me to pay $83 upfront in one lump sum? How does that make financial sense? I’d be paying MORE for a yearlong subscription rather than saving a few bucks. The operator stammered and then went back to the script of “locking in the subscription price.” Well, is the price going to go up then? No. I don’t know. Maybe. By how much? I don’t know. When? I don’t know. But it might. Is there anyone else I can talk to about this? Not right now. OK, at this point, I hung up. Deconstructing this entire experience, from a webconomics point of view, this is an absolute disaster. The LA Times has made it difficult and frustrating for existing subscribers to attempt to continue to be subscribers. They’ve cut costs in their circ department by outsourcing all the call center jobs to places where ill-trained people stumble over what should be easy points. And finally, their pricing structure makes no sense once you drill down and work the numbers for yourself. And the numbers are completely different on the web, in the mailers, according to the people on the phone. The price just keeps changing! This makes it impossible for the end-user (i.e. subscriber) to trust the prices that we’re being given. Yeah, it’s only a few bucks, but come on, now. You guys know – or SHOULD KNOW – how consumers react when they start to suspect that someone else is getting a better deal. I’ve written at length over the years about the migration from an ad-supported revenue model to a subscription-based model (AKA “paywalls”). The jury’s still out on how well this is going to work out for the newspaper industry; yes, the New York Times, Financial Times and Wall Street Journal are often cited as success stories (although detractors point to weaknesses in their underlying dynamics). News organizations across the board are looking to ways that they can support themselves by charging subscriptions to access their material. This only works when that transaction is quick, easy and painless. Years ago, working in Russia, back when the whole “Content Pirates” project was just the mere glimmering of an instinct, I was talking with the local techies about how the web works in Russia. At the time, we were trying to implement an internet-centric business model for a publishing company, and were coming up against massive cultural differences in how to make money off of content. 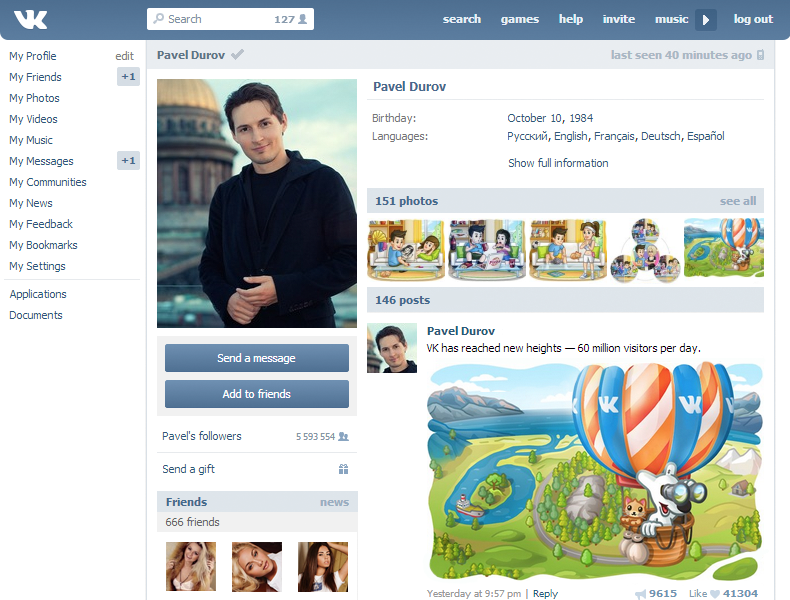 This profile for vKontakte founder Pavel Durov is particularly ironic, since he just bailed out of the company, citing intense pressure from Kremlin-backed investors. 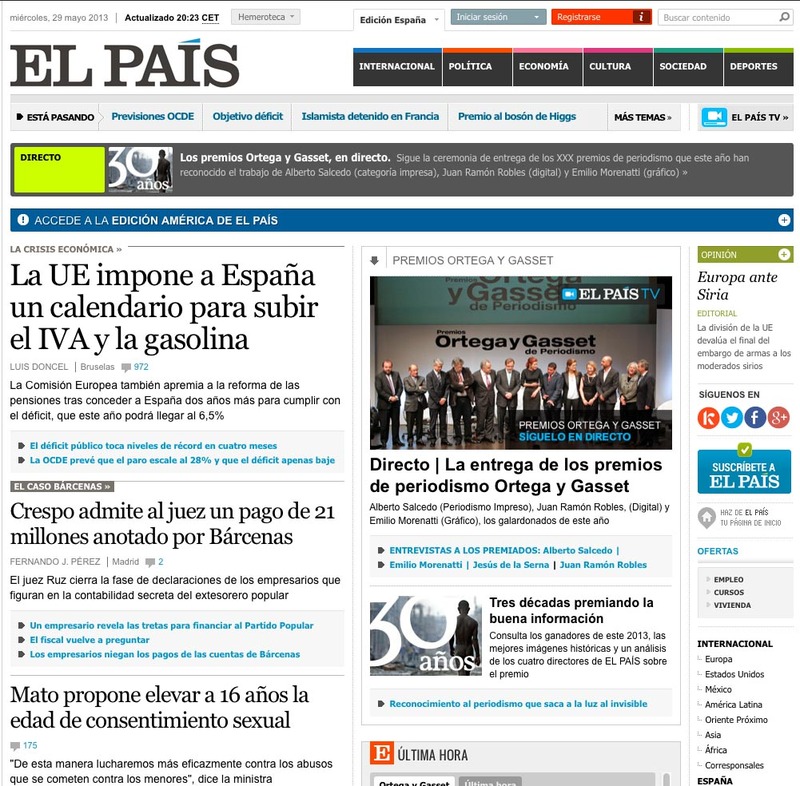 The site has 143 million users worldwide, 88 million in Russia. They generate about $170 million a year in revenues, mostly from advertising. And the site is rife with pirated works. Posted: under Blogging, Lemmings, Sip With Caution. The “Follow/Unfollow Dance” builds your lists … but to what end? Every school had one. The kid who pretended to be your friend just to get something he wanted from you and then acted like you’d never met. The user. Not the model you would build a business around and certainly not the model for a business social media strategy. If you’ve been paying attention to the growing phenomenon on Twitter of people who want to bill themselves as thought leaders & social media experts following you & then unfollowing you a few weeks later after snookering you into believing there is a mutual interest, this sad saga will seem very familiar. I’m having my own issue with it myself – I’ve noted that a lot of the people that I follow don’t seem to actually be interested in connecting with me, other than to connect. I don’t get any follow-up conversation out of the connection. I’ll admit it. I’m not as diligent as I should be in following/unfollowing and tracking everything that’s going on in the social sphere. Been spending a lot of time on content creation the past few months – writing books, creating lesson plans, wireframing sites, handling social media for other people … so yeah, mea culpa. 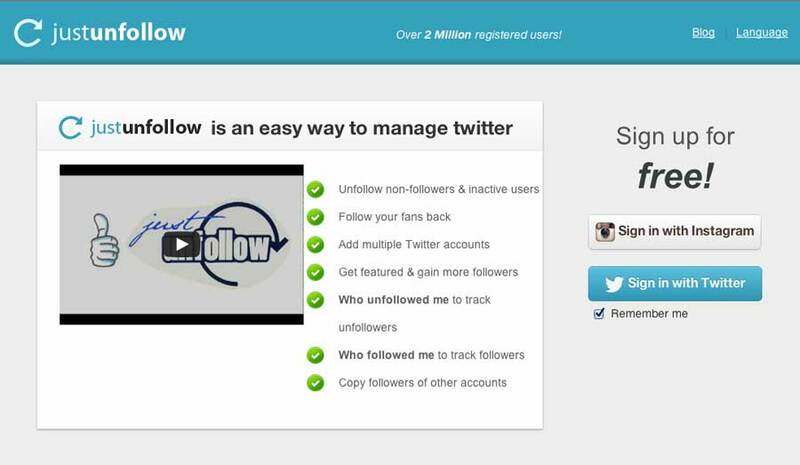 I turned to JustUnfollow to see if this would help. JustUnfollow purports to help you keep track of whether or not you’re being gamed … and perhaps even to start gaming the system yourself (Not Recommended). I am dismayed, but not surprised, that services like this are becoming common & in-demand. 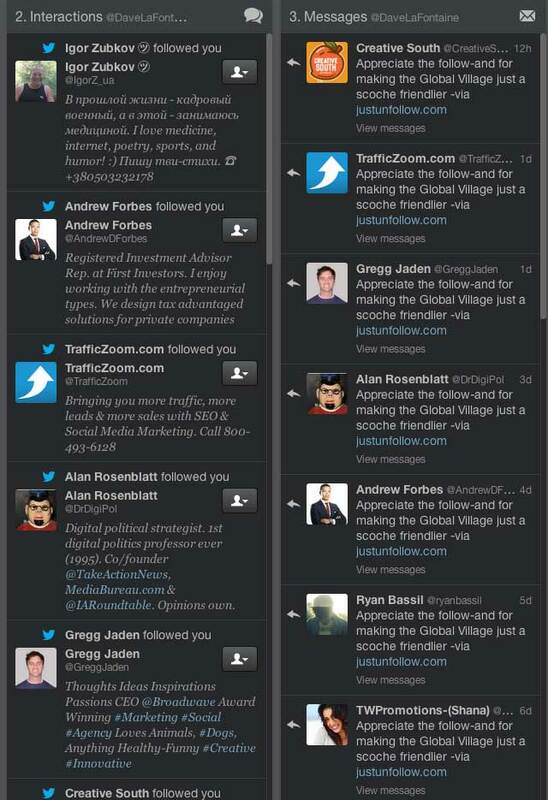 The service generates a DM that you can customize to say thanks to the people that follow you. It’s kinda filled up my DM column with these messages. As you can see, I tried to make the “Thanks” message a little less boilerplate sounding. I get a steady stream of notifications as to who has followed me in Tweetdeck. This is handy, as the notifications often wind up in my spam folder in Mail. However, this is still something of an impersonal-feeling process, mostly because I’ve been slacking off on actually connecting with those who connect with me. My bad, people. Apparently, I’ve been rude. Didn’t realize that I was doing so. I was buried under book deadlines, designing a multi-platform site for a client, and teaching a class. Still, I was negligent and I got called on it. Worse, it seems the solution I tried to impose has actually done the opposite from my intentions. It appears that in trying to set up a system by which I rewarded people with at least a DM for following me, I somehow stumbled into a situation where that DM is seen as the very thing that I was trying to avoid. I probably need to go in and tweak the settings on JustUnfollow to make sure this doesn’t happen again. Also, I should probably use JustUnfollow to see if there is some chicanery going on with my Follow/Unfollow stats. I’m interested in connecting with journalists and New Media thinkers, to widen the variety and depth of the info-flow that I expose myself to. However, I still struggle with taming the torrent. And yeah, I know that is ironic, given the stated mission of this blog. But The situation is not being helped by the amount of “Hey, are you really paying attention to me?” messages coming at me, especially when compared to the “Social Media Users” that are trying to get me roped into following them, just so they can boost their own Klout score. Here’s what I wrote as a comment on Erik’s blog. And yes, I do recommend that you follow him. Unfortunately, I am locked in exactly this kind of dance myself on social media. As the number of Twitter followers you have starts to become a real badge denoting authenticity and authority, the incentives are there to “game the system.” I’ve tried to restrict my Twitter feed to only people that I actually can pay attention to; when in the early days, I went nuts and got up into the thousands, my feed was streaming so fast that I couldn’t actually get any value out of it. Which brought my efforts to the equivalent of spitting into a vast, anonymous torrent. I’ve got quite enough of that trying to engage in the blogosphere, thank you very much. Whenever I see Twitter accounts with 40,000 followers and 40,000 following – well, I know that the person has devoted significant time to building a list and a presence. But it makes me wonder – will they actually respond to an attempt at conversation? Can they? Is it even possible with the flow from 40K people coming through HootSuite/Tweetdeck? I couldn’t do it with 1500. And if the point of social media isn’t to actually have a conversation with people about something of mutual value … then what’s the damn point, anyway? Just start graffiti’ing up billboards and save the rest of us from the tricks and games, already. 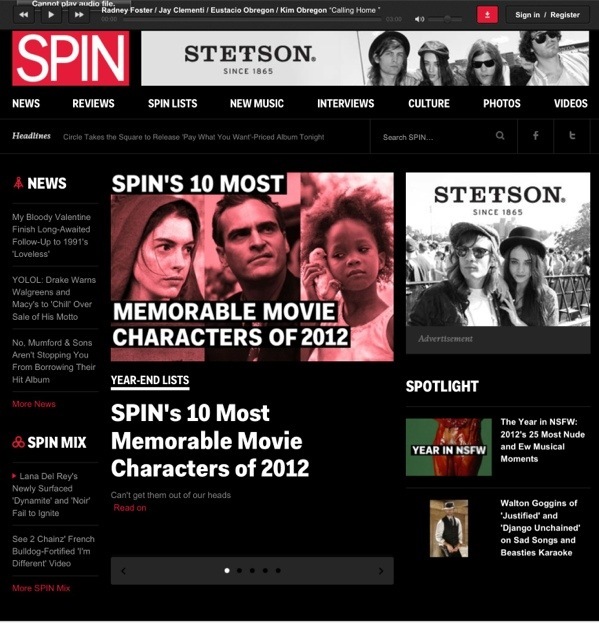 Spin magazine is killing its print edition-tell me how paywalls would help this situation? I keep hearing over and over again that the demise of Murdoch’s The Daily means that digital magazines don’t work, the real solution to the revenue problems is to “fix the original sin” and put all content behind a paywall. The thinking seems to be that since the New York Times has said that circulation revenues are equal to ad revenues, that must mean that paywalls are the long-awaited saviour for the news business. Over the course of the last decade, ad pages gradually declined from 661 in 2003 to 378 in 2011, a 43% drop, according to the Publishers Information Bureau. More recently, ad pages plunged another 40% from 287 in the first nine months of 2011 to 171 in the first nine months of 2012. On the circulation front, in the six months ending December 2011 (the most recent period for which data is available) Spin had a total circulation of nearly 460,000 down 15% from 540,901 in the same period of 2005, according to the Alliance of Audited Media, formerly the Audit Bureau of Circulations. OK, so take a second and mull over those numbers. When your ad revenues diminish by 75% while your circulation is only down 15%, what does that really mean? Does it mean that the audience has abandoned your product? Or does it mean that advertisers have abandoned your product? Of course, it means the latter. The young, hip audience that buys music (and all the related lifestyle accoutrements you see in music mags, such as t-shirts, DeVry University classes on how to be a music producer, black light posters & urine-cleansing supplements), is now getting their music online, not from the no-longer-existent music stores. Why buy an ad in a print product that doesn’t offer a quick and easy way for the now-engaged audience to seamlessly buy what you’re selling? It’s more effective than print, and (due to continuing wrongheaded ad sales policies) cheaper too. The challenge here, once you make the shift to all-digital, is going to be offering some kind of as product or experience that differentiates your music mag from all the music blogs out there that have much lower cost overheads. 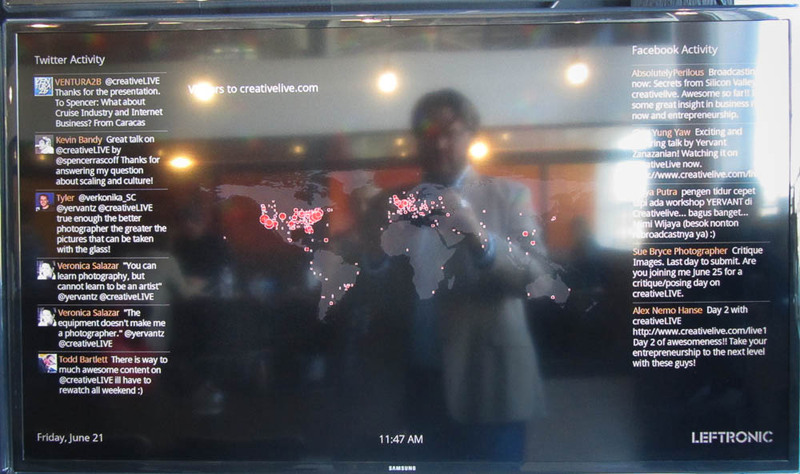 I’ve always said that the places to watch for innovation are music and video games. Keep an eye on this space. If there are going to be innovations, they are likely to show up here first.